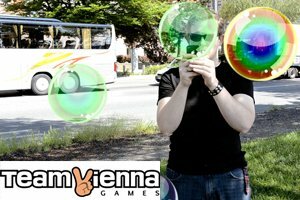 Huge potential for AR Games Bubble Tap was developed exclusively on Wikitude by Team Vienna Games, (MMO 7Million, Facebook Zombiees!) whose founders are former staff members of Rockstar Games. Bubble Tap features a fun and engaging interface that invites users to pop a series of bubbles floating around them. As the player progresses the difficulty increases with longer series to pop, causing the player to become more and more physically involved with the game. Not just your standard “Tap and Pop” – Bubble Tap in AR utilizes a 360° gaming surface with players having to physically rotate to get higher scores. Bubble Tap is available on Wikitude for both iOS and Android. Nicola studied Geo-Information Science in Rottenmann, Austria. After nearly 3 years of gathering experiences in software-developement and project management at Real Networks, she joined Wikitude in July 2009 and likes managing projects and all geo-relevant areas this job involves. She loves skiing and spending time with friends.